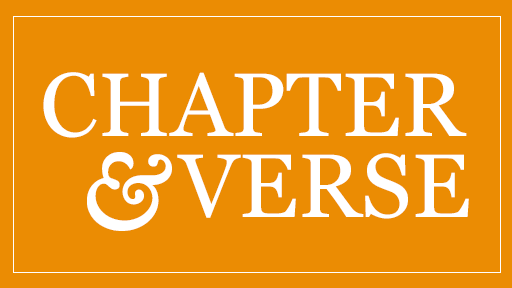 TIM O’BRIEN, correspondent: While the crime rate has steadily declined in the United States over the last two decades, the incarceration rate has all but exploded, from around 300,000 inmates in 1972 to roughly 2.3 million today. The United States has only 5 percent of the world’s population, but nearly 25 percent of the world’s prisoners. BRYAN STEVENSON (Executive Director, Equal Justice Initiative, Montgomery, Alabama): We cannot maintain our credibility, our legitimacy as a nation when we have the highest rate of incarceration in the world. O’BRIEN: Bryan Stevenson runs the Equal Justice Initiative in Montgomery, Alabama, a public interest law firm devoted to representing youthful offenders and those who cannot afford a lawyer. STEVENSON: We’ve got six million people on probation or parole in this country, 68 million Americans with criminal arrests, which means when they apply for a job they’re going to be compromised, they’re going to be disadvantaged. STEVEN RAPHAEL (Professor of Public Policy, University of California Berkeley): Instead of spending so much money on incarcerating very old inmates, we could also use that money to hire more police, we can use that money to have anti-violence interventions for youth, and we can be more proactive about having a society that is less violent and generates more productive citizens. O’BRIEN: The cost of keeping a single inmate in prison varies widely, from almost $15,000 a year ($14,603) in Kentucky to more than four times that ($60,076, Vera Institute, 2012) in New York State. Overall, we now spend roughly $80 billion a year in the US on jails and prisons, compared with only $6 billion in 1972, a 13-fold increase. (to Raphael): True or False: Our streets, our neighborhoods are safer today because more criminals are in prison. RAPHAEL: Well, I would say that we have less crime with more people in prison. That’s true, on average. But when the incarceration rate gets very, very high, we start locking people up that probably would not be committing a whole lot of crime if they were on the street. O’BRIEN: Still, when someone commits a horrible crime, the victims, their loved ones, and many others want “justice,” that is, retribution, and to some that means sending the offenders away for a long time regardless of whether they might ever do it again. MAN: You know, if somebody takes an eye, you can't just be like, "Oh, slap on the wrist." You can't. O'BRIEN: Getting tough on crime has taken on a life of its own. MICHAEL STOLL (Professor of Public Policy and Urban Planning, UCLA): Once you enact tougher crime legislation, it’s very hard to get soft on crime. People campaign on getting tough on crime, opponents could match the intensity of that by saying they're just as tough at getting on crime, and virtually no one—at least up until now—gets elected by saying they’re going to reduce sentencing and get soft on crime. 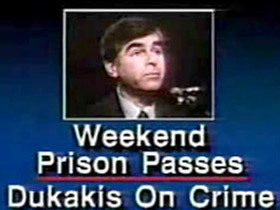 O’BRIEN: Just ask Michael Dukakis, whose support for a prison furlough program while governor of Massachusetts may have cost him the 1988 presidential election. The impetus for mandatory drug sentences and long prison terms may have been the soaring crime rates from 1960s through the late 1980s. There’s a growing body of evidence, however, that those remedies in some respects were not only unfair, they were racially discriminatory. And there can be no question that the so-called “war on drugs” has had a disproportionate impact on people of color—Hispanics and African Americans. The National Institute of Justice reports that African Americans are incarcerated at nearly six times the rate of whites, and that if the trend continues, one in four black males alive today can expect to spend some time behind bars. It is true that those in the lower socioeconomic classes are more likely to commit certain crimes. But Raphael and Stoll insist that does not explain the gross disparity in sentencing, noting that the incarceration of young black men charged with drug offenses has been a key driver of prison growth. PROFESSOR RAPHAEL: One hundred times as stiff. PROFESSOR STOLL: One hundred times, right. Now it’s been reduced down to 12, but it was a hundred times greater than it was for possession of powder cocaine. Blacks traffic, disproportionately, in crack cocaine relative to powder cocaine. PROFESSOR RAPHAEL: However, there are also other issues. It’s the case that African Americans, when they are charged, they’re less likely to make bail, they’re less likely to make financial bail. People who are held in detention pre-trial are more likely to plead guilty and are more likely to be sent to prison. There’s some who believe there are aspects of the criminal justice system that are unfair, that there might be discriminatory treatment by police, by prosecutors, and by judges, and so on and so forth. STEVENSON: We have a history of racial inequality and racial injustice that has left us compromised, left us vulnerable to presuming guilt and dangerousness when minority people interact with the criminal justice system. I think too many black men and boys are presumed dangerous and guilty when they’re walking the streets. 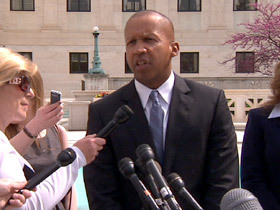 O’BRIEN: Bryan Stevenson has earned a reputation as one of the leading civil rights advocates in the US Supreme Court, having won landmark cases on the rights of juveniles. 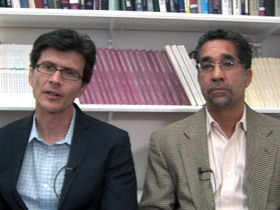 He says racial bias in our justice system may not always be obvious, may not even be intentional. But that does not mean it isn’t there. STEVENSON: I’m a middle-aged lawyer, been practicing law for thirty years, and even I get presumed dangerous and guilty sometimes. I was in a courtroom in the Midwest getting ready for a hearing one day, and I had my suit on and my shirt and tie—I think it was maybe this suit—sitting there at the counsel table, and the judge walked in and he saw me sitting at defense counsel’s table, and he looked up and he said, “Hey, hey, hey, hey. You get out of here. I don’t want any defendants sitting in my courtroom without their lawyers. You go back out there in the hallway and wait until your lawyer gets here. And I stood up, and I said, “Oh, I’m sorry, your honor. I didn’t introduce myself. My name is Bryan Stevenson. I am the lawyer.” And the judge started laughing, and the prosecutor started laughing. I made myself laugh because I didn’t want to disadvantage my client. And the client came in—a young white kid who I was representing at this hearing. But afterward I was thinking to myself, what is it about that judge that he sees a middle-aged black man in a suit and a tie at defense counsel’s table, and it doesn’t occur to him that that’s the lawyer? Do I think that that judge is going to treat minority defendants differently? I do. Do I think that’s going to manifest itself in disparities based on race? I do. And that’s not somebody who is consciously bigoted; that’s not somebody who is proudly racist. That’s just somebody who has inherited this narrative of racial difference that compromises us in all kinds of ways. And in the criminal justice system, you see evidence of that that is very, very problematic. O’BRIEN: If you ran the zoo what would you do? STEVENSON: I would certainly do away with mandatory minimums. I would stop incarcerating people for drug possession, and I would declare an end to this misguided war on drugs. I would eliminate some of these extreme punishments. I would stop treating children as an adult. You know we’ve now got some 250,000 people in jails and prisons, serving long prison sentences for crimes they were alleged to have committed when they were young children. And then I would engage in the kind of serious rehabilitative work that you see in many countries in Europe. US ATTORNEY GENERAL ERIC HOLDER: We put sensible limits on when it was appropriate to seek stiffer sentences based on a defendant’s prior criminal record, and we took steps to improve reentry processes in order to reduce the chances that incarcerated individuals reoffend after they exit prison. MICHAEL THOMPSON (Director, The Council of State Governments Justice Center): We found the kid who stayed in the community was 20 percent less likely to reoffend than the youth who was released from the state correctional facility. Furthermore, we found the kid who was released from the state correctional facility is three times as likely to be rearrested for a felony than the youth who was under community supervision. And here’s the most interesting thing: We also save a whole lot of money keeping that kid closer to home. O’BRIEN: A blip on the radar? Or are we on the cusp of a new approach to crime and punishment? The old approach—mass incarceration with lengthy sentences—may have made some Americans feel better. It does not appear to have made anyone any safer. For Religion & Ethics NewsWeekly, I’m Tim O‘Brien in Washington.